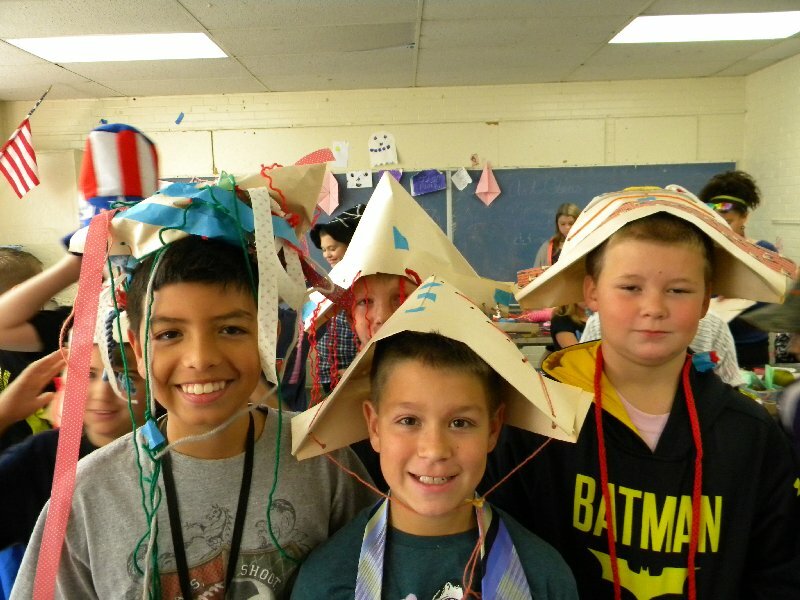 I do origami at all grade levels. So many educational bases can covered. 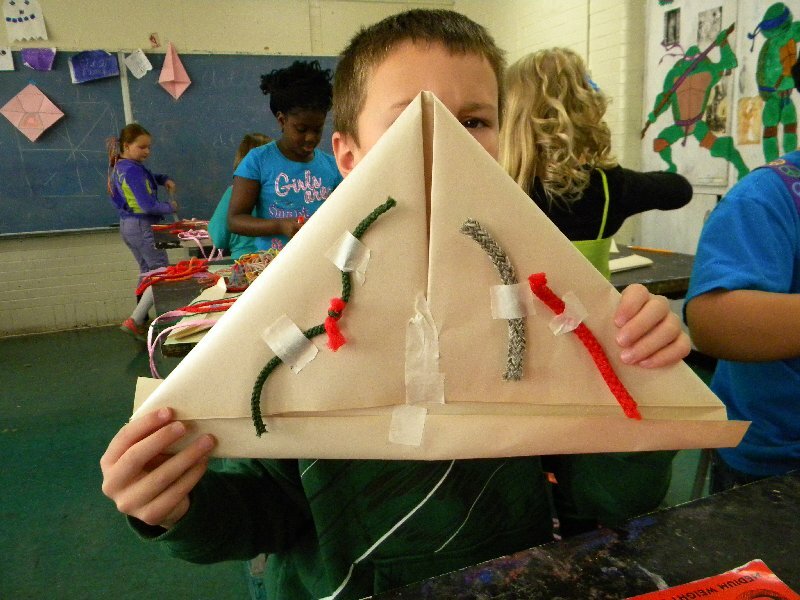 Realizing something starts as a 2-d shape and then becomes 3-d is a concept ODE will test for under the heading of nets on the math test in 4th and 5th grade achievement tests. 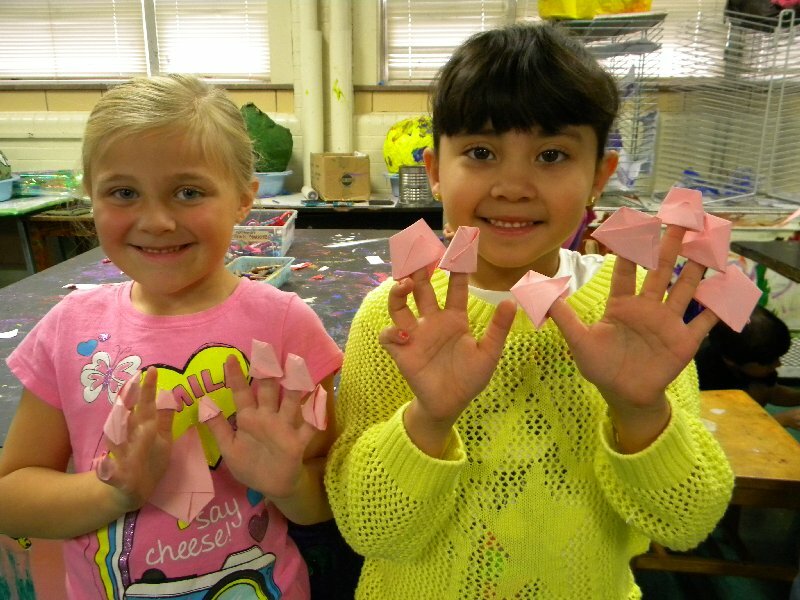 I use origami to introduce and work on fractions, different shapes, and lot of following directions and listen skills are directly engaged when a student does origami. 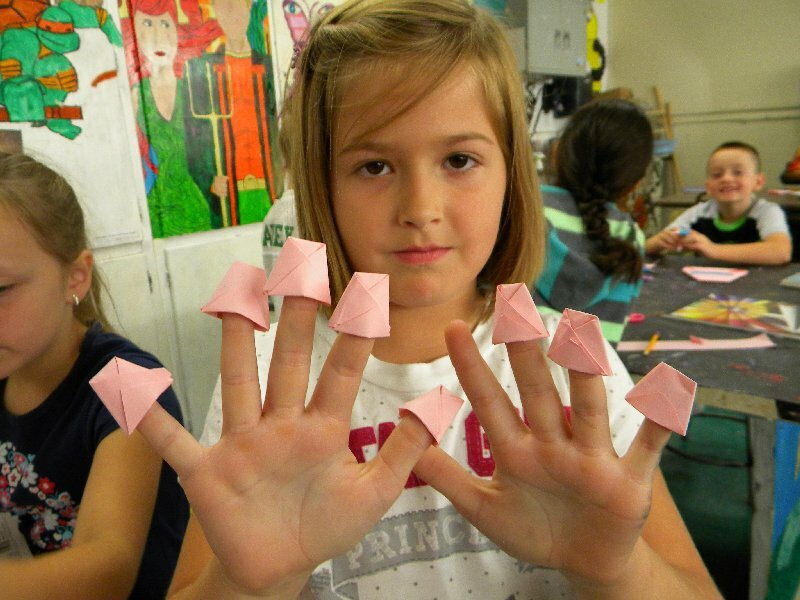 In the pics above we had worked on doing cups and when the students get the hang of it, I pass out small strips of paper they can fold and cut into small squares to make small cups. All ages delight in doing small stuff. I still like it too. We also do bigger cups, as the student above is holding up. 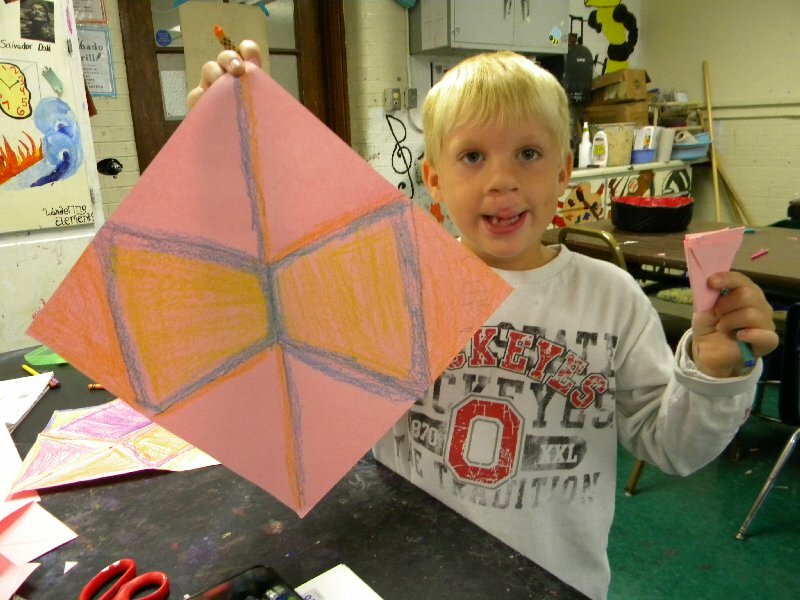 Here you can see he has unfolded the cup(as per instructions) and is coloring in the shapes created in folding the cup. 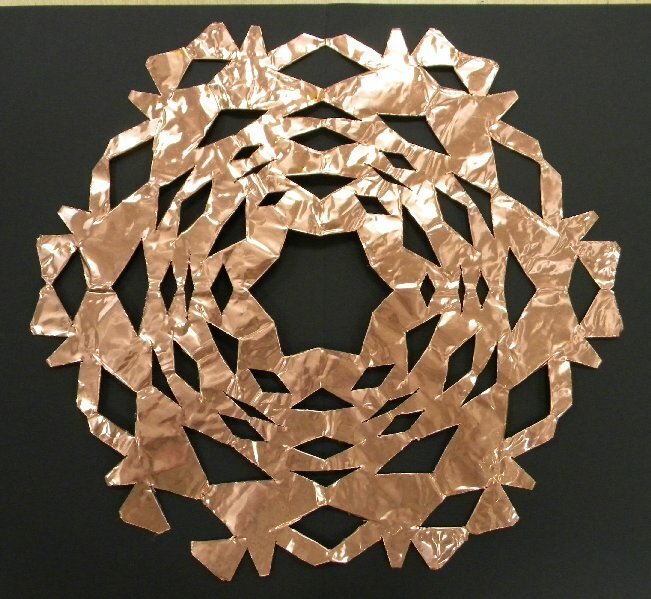 6/8 are triangles and 2/8 are trapezoids. Here’s a hat with some glued on additions. Wednesday of this particular week was “Wacky” something or other day so some of the students went nuts with the colorful additions. 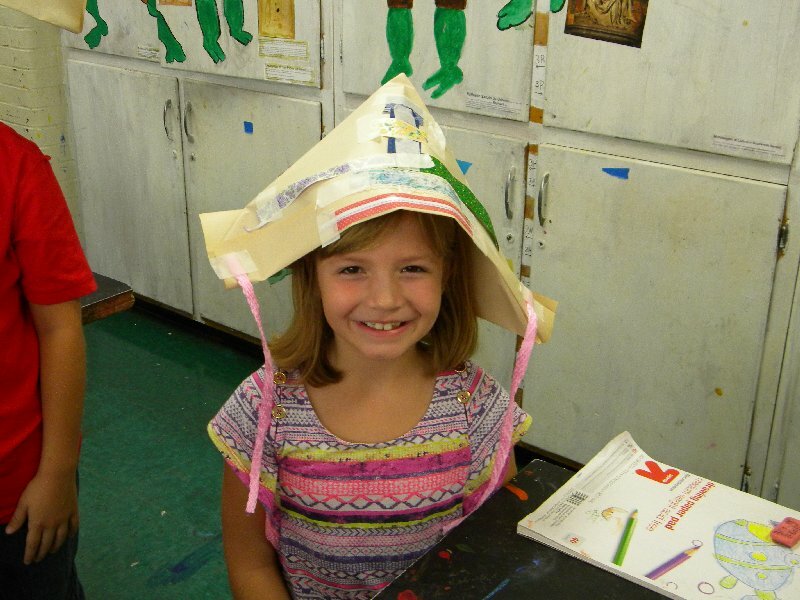 Nice shot of a happy child and a completed hat. 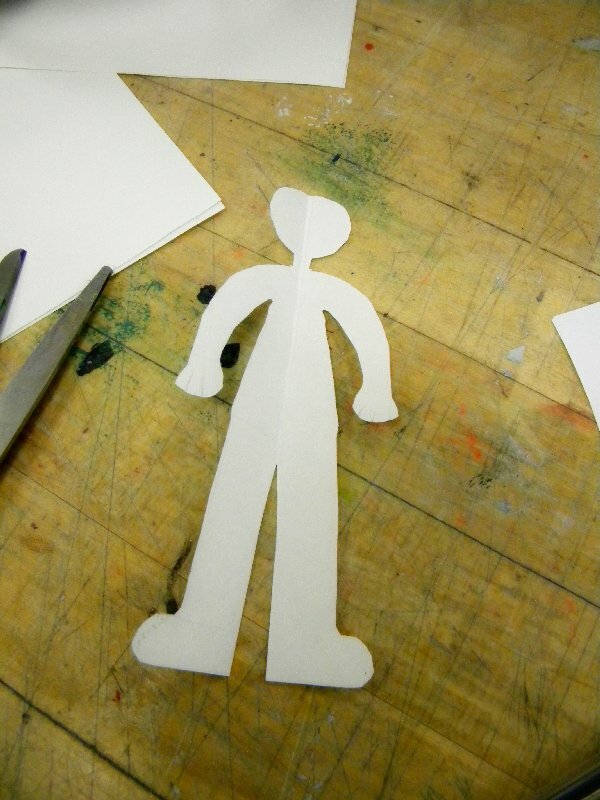 The kids like folding stuff and so do I.
I have always enjoyed folding and cutting paper. 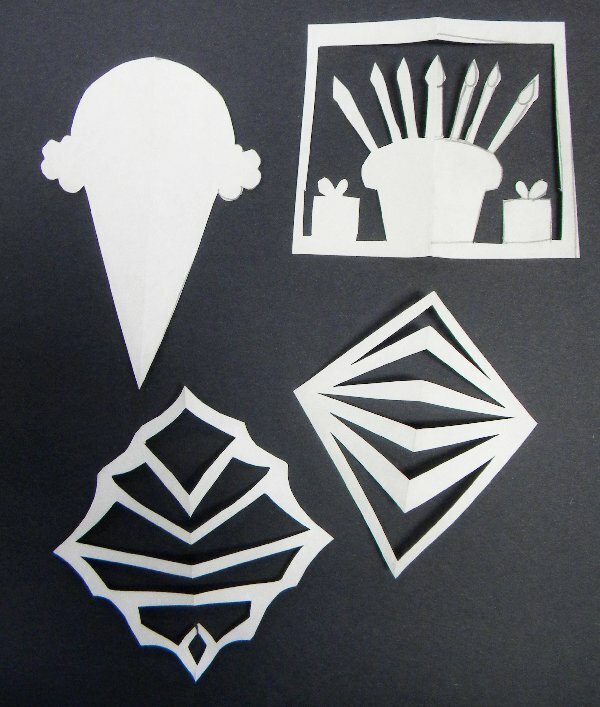 Pop-ups, origami, cutting, and pasting, it’s a problem, I like it all. 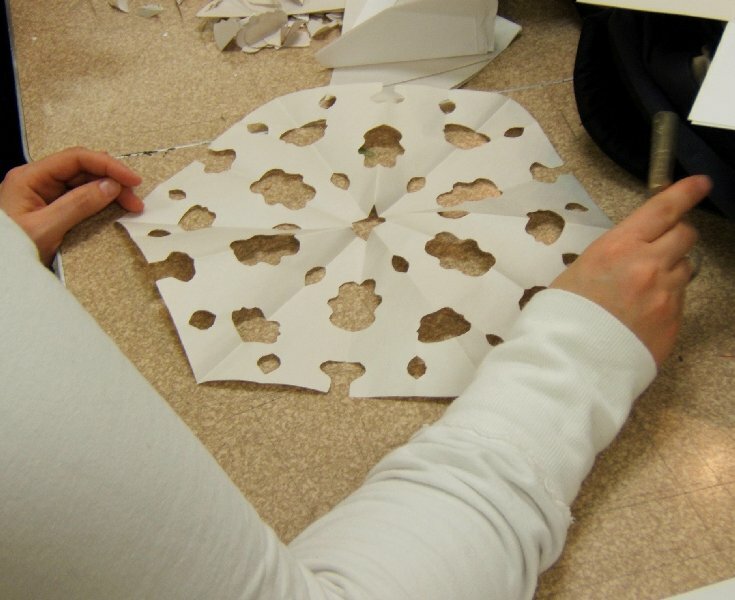 Paper snowflakes are no different. I generally fold a piece of regular copy paper(8 1/2 x 11)long wise, fold it into 60 degree triangles, and then start hacking away. If I’m teaching this to elementary students I’ll be teaching lines of symmetry, hexagons, sequencing, degrees in triangles, how to use a protractor, or some other such educational objective. 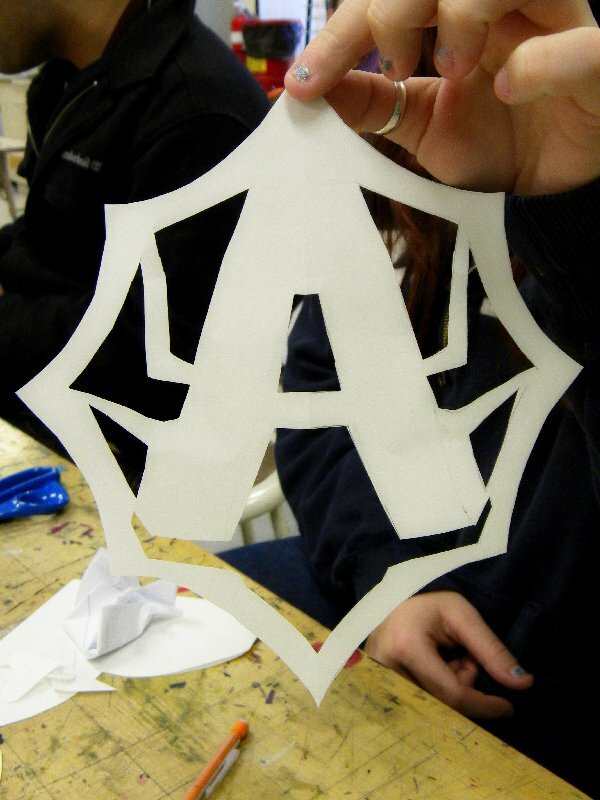 But really, in my head, I’m just cutting snowflakes. 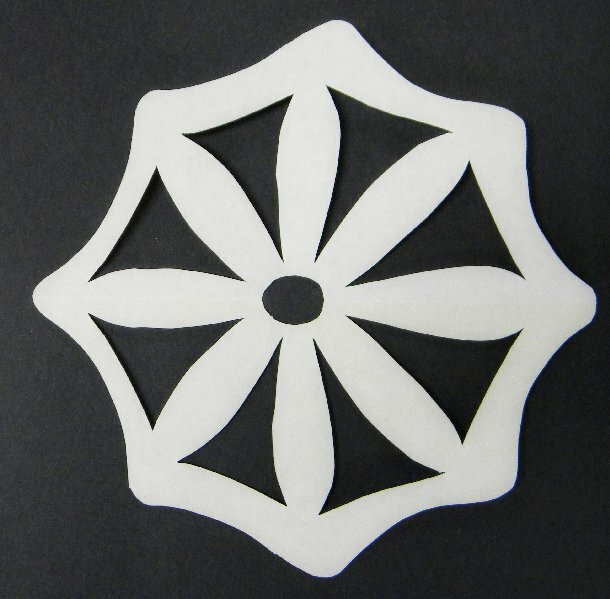 The above are good examples of easy to make six sided snowflakes. 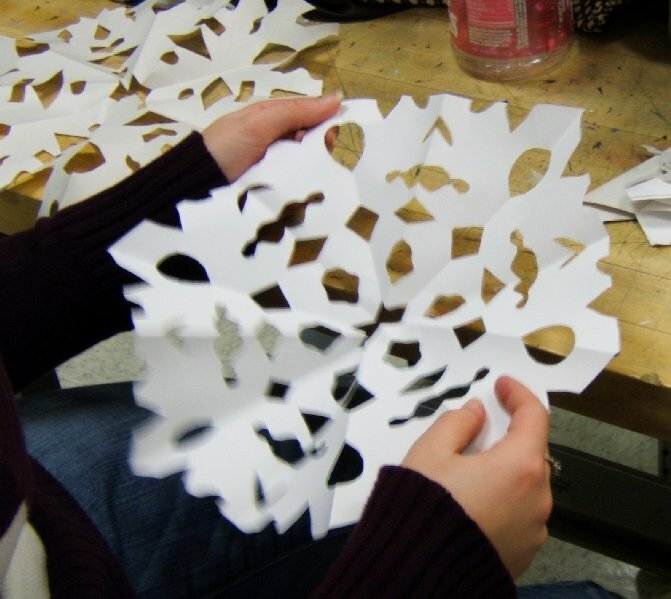 You don’t necessarily have to make the snowflakes from paper. 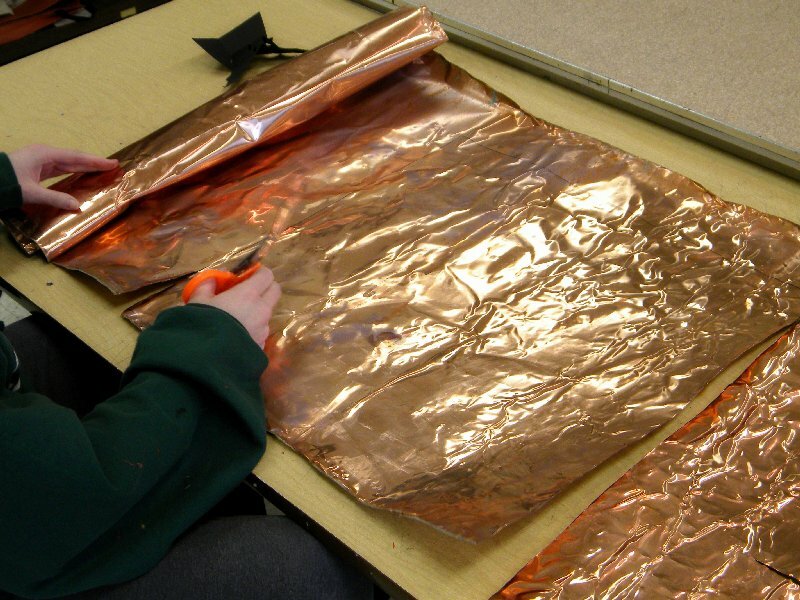 Here the student is cutting them out of very thin sheet copper. 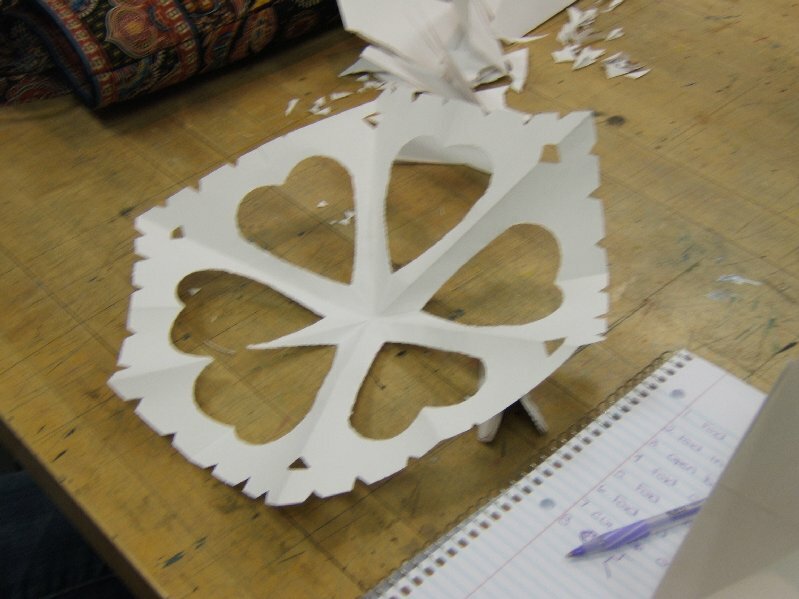 It’s a little more work physically, you sometimes have to use snips, saws, and a bit more muscle. 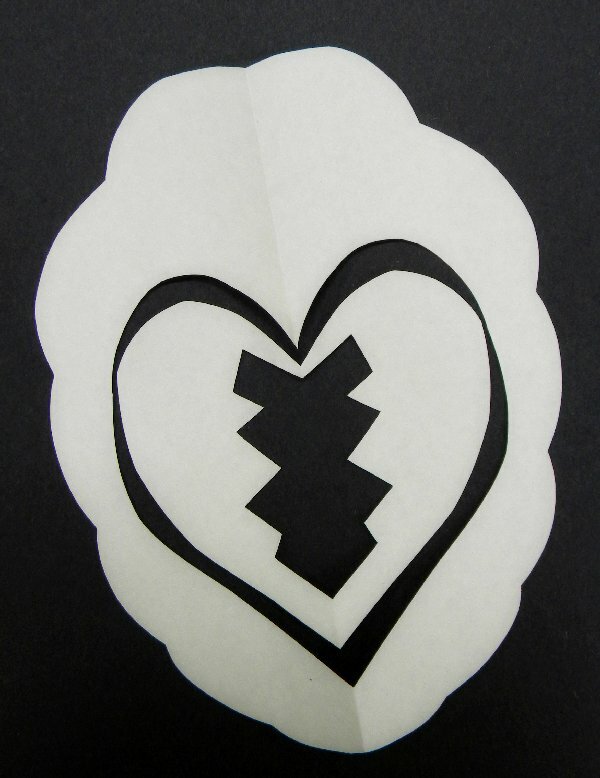 the one below is how it came out. 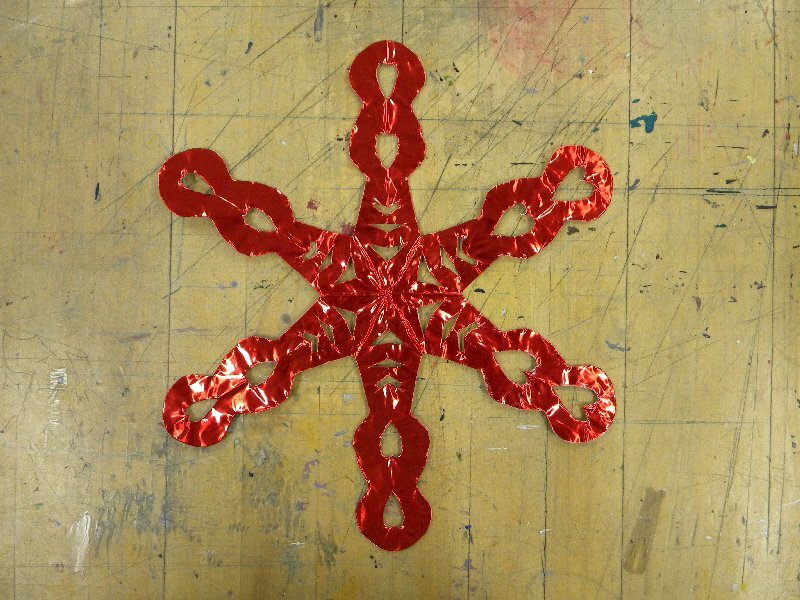 This one is cut from thin aluminum that is colored red on one side. This came out real well. I should have chosen a better background color. You don’t have to stick to just doing 6 sides either. For the younger student six sides can be a bit challenging so just folding a piece of paper in half and talking about symmetry and lines of symmetry can be useful lesson. I did this one. 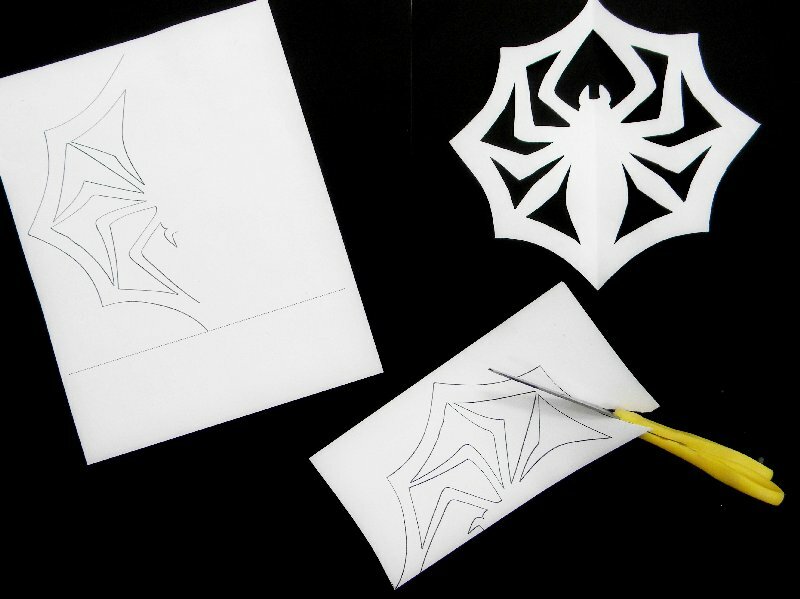 I used the spider web idea(see below) from Jacks Paper Snowflake, from the movie, The Nighmare Before Christmas, and cut out the Christmas tree and bats instead of the spider. I have to do this again and cut the mouth, fangs, and eyes a bit better, maybe add a skull at the top. 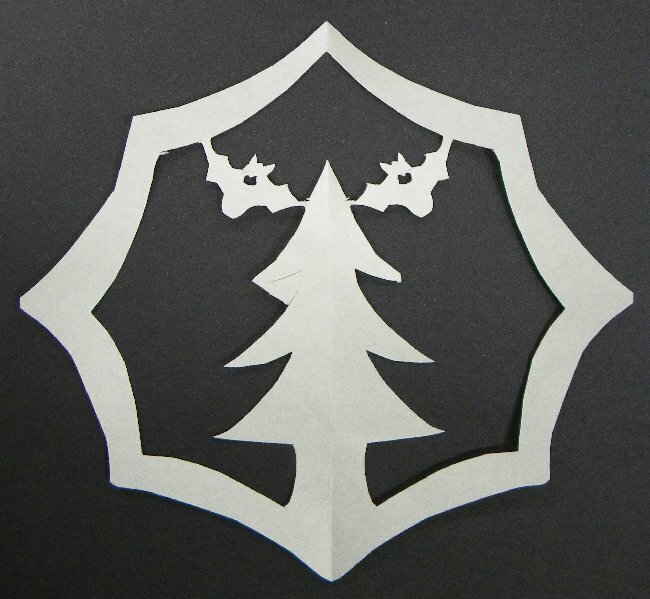 That would just scream Christmas spirit, wouldn’t it? 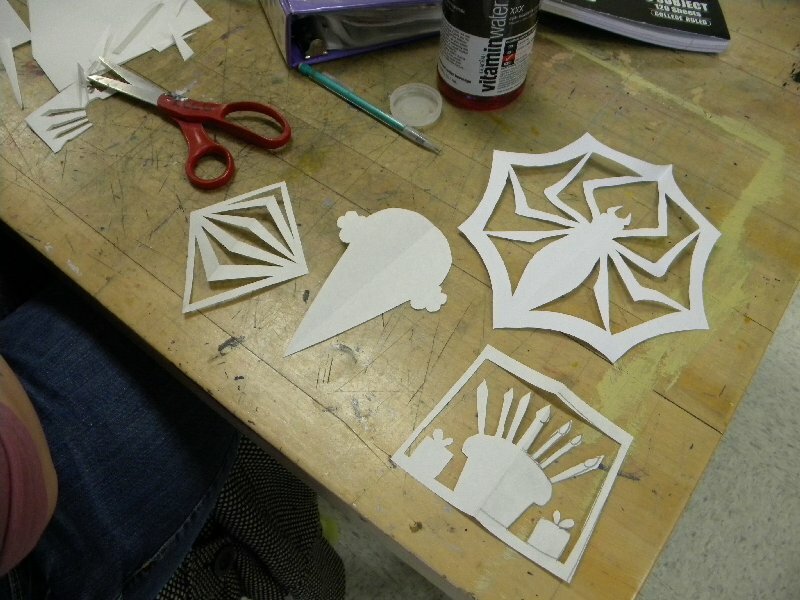 This is three stages of cutting out the spider snowflake from the movie. Michael in class said he remembered the movie and one of the characters cutting out a spider. I googled the appropriate words I thought would work and an Instructables lesson/episode(see above links) popped up with a a printable PDF. I’m always glad when a student suggests something I have not done before. 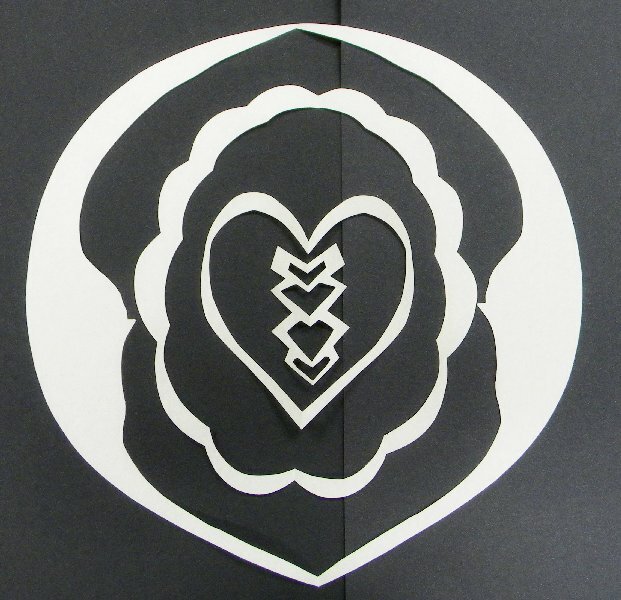 More examples of cut paper lines of symmetry. I think Mr. M in the back of the room made the one above.